Following a strong, united Labour Party conference, the country now needs a General Election as soon as possible to allow this radical political force to negotiate a sensible Brexit deal with Europe. We need a reforming Government to replace the worn-out ‘May and Johnson’ sideshow that has done so much damage to our national economy and foreign relations, our currency, our defence and our National Health Service. 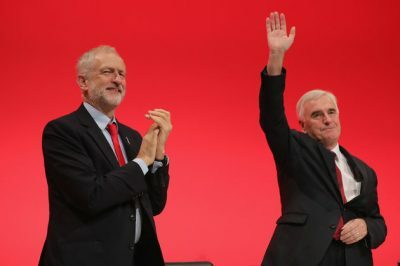 After this week’s rousing Labour conference, Jeremy Corbyn has now firmly established himself as the next Prime Minister with the impressive John McDonnell as Chancellor. Together they make an exceedingly strong team, not least to finalise the current failed Brexit negotiations with Europe. Labour will take back the railways and utility companies into public ownership in order to provide a state-owned and operated, modern mass transport system for the 21st century and to regain state control of water, the vitally important natural resource for life. Both of these are integral parts of a new, radical approach to government that has been so obviously lacking within the current Conservative administration. Democracy is government by the people and for the people – that means all the people not just the bankers, bond dealers, hedge-fund operators and currency gamblers in the City. Labour is now a party of integrity that has undertaken to work for everyone in this country who is entitled to vote. That alone is one of the principal differences from the current tired, out-of-touch administration. A Labour Government will show the world that British goods and services, and British enterprise, are ready to compete with the best in the world. We are already the leaders in many fields and with a radical, reforming government that will bring in legislation to support industry and commerce and all those who work in companies and organisations throughout the United Kingdom, we will once again be proud to be British. Proud to develop new goods and new markets, worldwide. But the country needs a General Election in order to move forward. Enough economic and political damage has already been done. Let’s put a stop to that, now! This is not a party political message – this is plain common sense. Hans Stehling (pen name) is an analyst from the UK. He is a frequent contributor to Global Research.